In normal production servers are running in single machine. If that's machine may be failed due to crashed or hardware defects or OutOfMemory exception then our site can't access by anybody. so how to solve this problem?. to add more tomcat machine to collectively (group/cluster) run as a production server. (oppose of single machine). 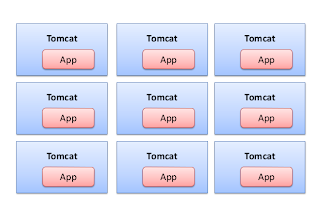 Each tomcat has deployed the same web application. so any tomcat can process the client request. If one tomcat is failed, then other tomcat in the cluster to proceeds the request. Here one big problem is arrive. 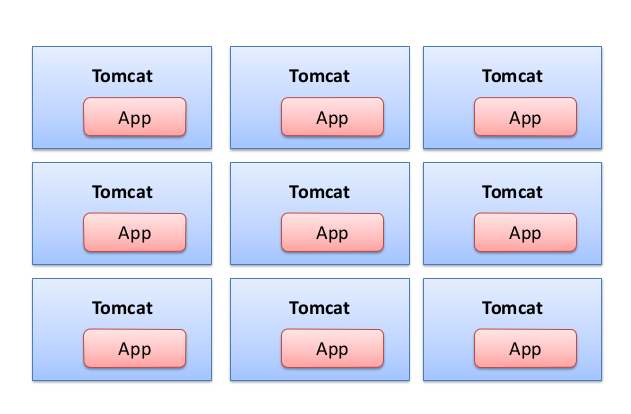 each tomcat instances are running in dedicated physical machine or many tomcat instances are running in single machine(Check my post about Running multiple tomcat instances in single machine). so each tomcat running on different port and may be in different IP. To add one server in-front of all tomcat clusters. to accept all the request and distribute to the cluster. so this server acts as a load balancer. There is lots of server is available with load balancing capability. here we are going to use Apache httpd web server as a load balancer. with mod_jk module. so now all clients to access the load balancer (Apache httpd web server) and don't bother about tomcat instances. so now ur URL is http://ramkitech.com/ (Apache runs on port 80). Here we are going to use Apache httpd web server as a Load Balancer. To provide the load balancing capability to Apache httpd server we need to include the either mod_proxy module or mod_jk module. here we are using mod_jk module. Before continuing this post check my old post (Virtual Host Apache httpd server) about How to install the Apache httpd server and mod_jk module. and how to configure the mod_jk. For simplicity purpose i going to run 3 tomcat instances in single machine(we can run on dedicated machine also) with Apache httpd web server. 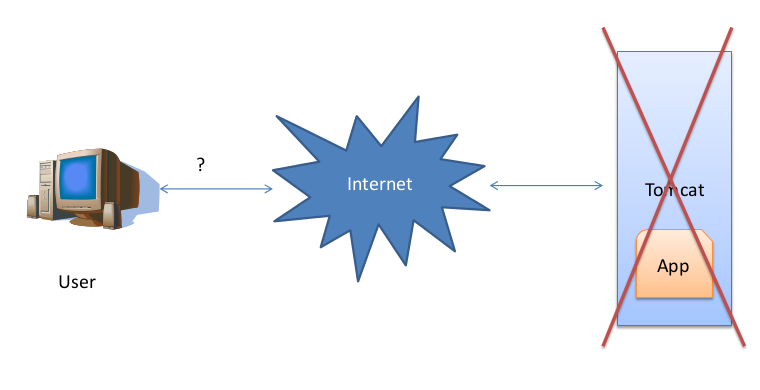 and single web application is deployed in all tomcat instances. 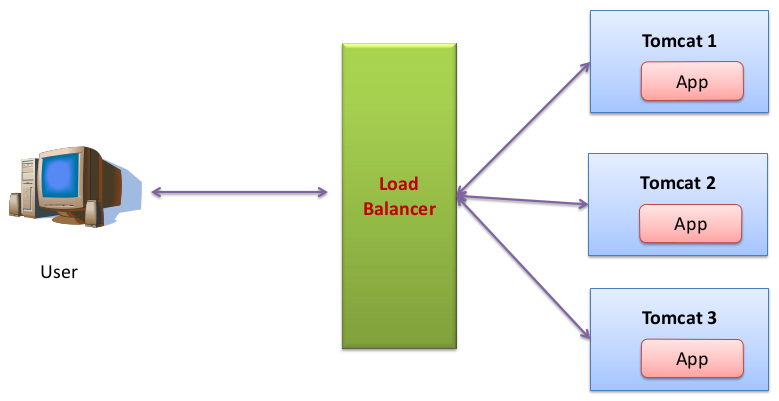 here we use mod_jk module as the load balancer. by default its use the round robin algorithm to distribute the requests. now we need to configure the workers.properties file like virtual host concept in Apache httpd server. here i configure the 3 tomcat instances in workers.properties file. here type is ajp13 and port is ajp port (not http connector port) and host is IP address of tomcat instance machine. there are couple of special workers we need add into workers.properties file. First one is add load balancer worker, here the name is balancer (u can put any name). Second one, add the status worker, Its optional. but from this worker we can get statistical of load balancer. here we use special type status. now we modify the worker.list property. so from outside there are 2 workers are visible (balancer and stat). so all request comes to balancer. then balancer worker manage all tomcat instances. Now workers.properties confiuration is finished. now we need to send the all request to balancer worker.